For more information on speech recognition with iOS devices, please click here. For those with a computer or mobile device utilizing a single audio connection serving as both the microphone-in and sound-out jack, you may have found that very few microphones and devices are made with the plug needed to interface with this jack. In fact, most headset microphones have two separate plugs – one for sound-out and one for sound-in. This adapter is designed to help you with this challenge. It separates the single jack on your device into two separate jacks, one for incoming sound (mic-in) and one for outgoing sound (sound out). Any user of an iPhone, iPad or Android device wishing to interact by means of a headset while on the road, while requiring added privacy, or when hold the device is simply not practical. Recording situations in which input to the mobile device by a hand-held microphone or musical instrument pick-up device is required. Owners of laptop computers (with single audio jack) wishing to use their favorite analog microphone for speech recognition or other applications. Most mobile devices will work with an external microphone of a certain “impedance” range. If not within this range, even though connected, the mobile device will still choose the on-board mic rather than the mic connected through the audio port. This isn’t always easy to detect, and requires that you do a test recording at varying distances from your mobile device and see if this impact the recording quality (if so, you’re using the on-board mic; if not you are using the externally connected mic). It not an easy process to learn the microphone impedance requirement for specific devices and determine whether a given mic will be accepted by your mobile device. Common wisdom is that an Apple device requires a mic with an impedance of at least 800 ohms. How can you determine in advance if your microphone will work? Honestly, this is hard information to come by. We have compiled a chart of microphone impedance and device compatibility for most analog mics sold on our site and this is shown below. The following chart shows some of the microphones on our site which we have specifically tested with this adapter on an iPhone 6. 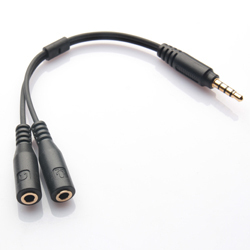 ***The Sennheiser ME3 requires use of our “ME3 adapter” in order to convert the plug to a standard 1/8 inch TRS plug. From Albert Garcia of Walnut, California on 6/11/2018 . Does its job really well. Remember this will not work for ALL types of inputs. For me it is working great! From Laura Geiger of Brantford, Ontario on 11/12/2017 . I bought this item to connect a set of headphones with microphone to my iPad and it works really well. From Anonymous of Tyler, Texas on 9/26/2015 . Customer service over the phone was excellent! From Richard Brown of Arlington, Texas on 7/8/2014 . I constantly use my iPad Mini for multiple tasks. This pigtail effectively splits sound and microphone from the 3.5 mm jack giving me maximum flexibility and ease of use with my language learning software. Great quality of sound in and out. Fast, reliable service from Speech Recognition Solutions. Well done. From G.C. of Berkeley, California on 6/2/2014 . This adapter did exactly what it said it would do. It allowed us to use a gaming headset (mic and headphones) with an ipod. Well done! 12/24/2015 – 1. I want to connect my Audio Technica Pro 8 HE to my iPhone (6s plus). Will it work with this adapter (re the 700 ohm issue . . . Regarding the shipping, I'm suspecting you are looking at US Postal Service "express mail" which is touted to be 5-7 days. Yes, this is what it costs. Priority mail is about 2 weeks and tends to be about half this cost. We used to allow use of "First Class Mail International" which runs only $10 or so, but we were seeing delivery times of nearly a month (or more) and got so many complaints that we discontinued it. Regarding the 8HEmW and iPhone adapter, I just tested the set-up and found that my iPad defaulted to the on-board mic, both alone and when also adding a P100 plug adapter. So I wouldn't recommend the combination. I guess this makes the shipping fee issue a bit moot. 4/30/2015 – Does this work with android smartphones with 3.5mm plug (e.g. Galaxy S5)? Response From Speech Recognition Solutions: While we haven't specifically tested this adapter with the S5, it is compatible with other Android devices, so I expect it will be compatible with your device. 4/15/2015 – hi guys. I have got an Audio-Technica PRO8HEMW mic and i want to use it with my Ipad air 2. Will this adaptor work for my . . . Response From Speech Recognition Solutions: The adapter works fine with IPad or IPhone but remember the PRO8HEMW does not have a speaker and when the adapter is plugged in it cuts out the devices speaker. 11/27/2014 – Does this enable the use of mic and headphone simultaneously? If I wear plugged in headphones and speak into a plugged in . . . Response From Speech Recognition Solutions: When used with an iPad or iPhone, yes, it does allow simultaneous use of the microphone in and sound out. But this does not mean you can hear your speech through the headset - this type of functionality would depend upon the device and software and not the adapter. Regarding the second part of your question, it's not really practical to use this with a MacBook, but only because the sound input on a MacBook is looking for a "Line-in" device and not a "Mic-in" device such as a headset microphone. The only practical way to interface most headset microphones with a MacBook (or any Mac for that matter) is with a USB adapter. 9/14/2014 – Would this work with Macbook pro retina display 2014? Response From Speech Recognition Solutions: Yes, this should work with most newer MacBooks that have a 4-pin TRRS connector. If you Apple earbuds w/ mic work, then this adapter will work.